In the second part of this book we will bring out a series of biographies of certain Germans from Erie County who have distinguished themselves in one way or another - they could be creators of commercial enterprise, or humanitarian workers such as doctors, teachers, academicians and journalists, or representatives of the arts, or the children of Lady Music. Naturally these small sketches are by no means all encompassing. There wouldn't be enough room for that. It may also be that we've not thought of some of our old German settlers. We trust we will be amicably forgiven. In the course of constructing a work of this proportion there's been an incredible amount of material on virtuous and industrious Germans in our county. One may say from the moment of its inception, the city has been affected by all in its development and prosperity. The main focus of this brief glance into the lives and deeds of each of these individuals stems from the desire to create a permanent testimonial to their accomplishments and their efforts. We will do our best to build a fitting memorial. We hope that we will successfully fulfill our goals. Mr. Heinrich Baethig was a thoroughly capable person with a multifaceted kind of genius. He was an old German pioneer in the truest sense of the word, not just a new settler in this city, this state or this land, but a pioneer when it came to life and its application. Born on 22.11.1809 in Halbau, Silesia, he attended the local school and then travelled to Breslau to attend the secondary school and pass the college admissions exams. Later he went the the university and matriculated into the Theology Department. His rich spirituality made his studies easy and he would have secured for himself a fine career were it not for his misgivings about the old fatherland. He came to the Promised Land, America. In October of 1850 he made the decision to emigrate. After a rather long voyage via sailing ship he arrived on the yearned-for shores in December. After seeing New York he figured the interior held more opportunity so he decided to come to Buffalo. His common sense told him that he wouldn't be able to make a living in his field, so he went into photography. It wasn't a solid profession but he was able to make a relatively good living. He wasn't completely satified with this undertaking so he decided to study pharmacy and medicine. In both fields he had success, especially as a physician. It gave him the opportunity to renew his good heartedness, his noble sensibility, and his love of humanity. Despite his busy practice, Mr. Baethig regularly took part in political events, though he did not actively seek or hold political office. He put all his energy and effort into generating fine and honorable principles in order to support and raise the interests of his fellow human beings. In 1847 he married Miss Adelaide Ziekursch, who gave him a son, now a practicing physican known as Dr. H. Bäthig, and a daughter, Louise, who is deceased. Mr. Heinrich Bäthig died on December 5, 1870. He was mourned by his family and friends and by the countless individuals whom he had assisted during the course of his blessed life. who was born in Görlitz, Silesia, attended the elementary and high schools of his fatherland and after passing the college entrance exams matriculated at the Royal Trade Academy of Berlin. He came to America in 1875 and studied at the Central High School in Buffalo. For a time he was a teacher at a large plantation in Louisiana. He returned to Germany in 1862 and was employed in a position of trust at the world famous factory of Cornelius Heyt. He returned to Buffalo in 1882 and became teacher and organist at the St. Mark's Evanglical parish. He has been a member of the faculty of Masten Park High School since its opening. He's a professor of German Language and Literature. Few men have earned the lasting esteem of their city and their circle of acquaintences the way Mr. Benjamin Gottwald Vom Berge has. Mr. Vom Berge was born on 27.02.1831 in Ottendorf, Silesia. He came from the old, noble families of the Prussian Provinces. 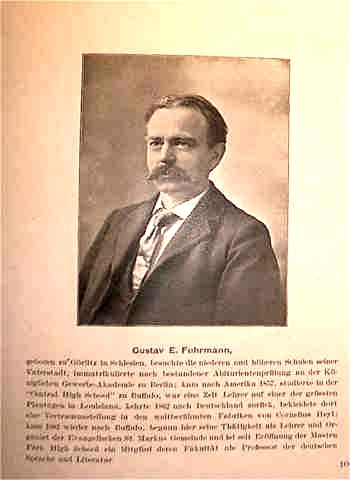 After attending the High School in Görlitz and later acquiring the technical knowledge of surveying, he went to the Royal Architectural Academy in Berlin, where he completed his studies in railroad construction. On November of 1853 he emigrated to America and settled in Buffalo. The then-booming city provided ample opportunity for employment of his skills and he acquired a fine reputation. With only a 2 year interruption he was involved in the implementation of the first phase of city planning. Considering the expanse of the city, this was not an easy assignment. When the job was completed he became a construction engineer for the building of the Erie Railroad, an assignment which lasted 6 years. In 1862 he was appointed Consulting Engineer to the city and in 1867 was nominated by the Democratic Party to run for the office of Chief Engineer. He was elected by the citizens of the city. In 1873 he was again a consulting engineer to the city and about 4 years after that he received the nomination of the Worker's Party for Chief Engineer. The Democratic Party endorsed the nomination and he was elected a second time. From 1881 to 1884 he was employed as the railroad technical specialist for the Lackawanna Railroad,and was then appointed consulting engineer by the city. He died on September 4, 1886 while at this post. His passing was mourned by all. Not only had the city lost it's most diligent, capable, and esteemed citizen but his fellow citizens, especially the Germans, had lost a loving and supportive member. Mr. Vom Berge married Miss Marie de Rutte in 1872. They had a son, Henry Vom Berge. 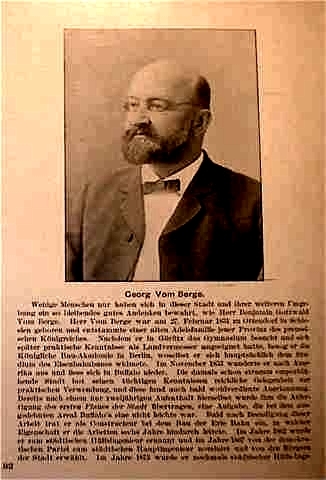 In his earlier years Mr. Vom Berge regularly took part in association activities. His social talents made him a treasured and esteemed participant. He was President of the Liedertafel (Glee Club) and the German Young Men's Association. In other clubs he was a highly respected member.